I’m not really a new years goal setting kind of person. This year, I decided to focus, not on goals or looking back, but more on something that is more all encompassing. Something that I can apply to a facet of things in the upcoming year. Maybe this came about as a rebellion to the overwhelming feeling you get when baby things start to accumulate, but I’ll take inspiration wherever it may show its face. Call it a mantra, a yearly philosophy or some other hippie phrase, but it is the thing I want to be present and overarching in all of my decisions and daily interactions throughout the year. It’s not a new saying. It’s not something I came up with on my own. It is, however, something I envision can seep into nearly every aspect of my life. I want to choose quality content to be posted on this blog and not just quantity. I’d rather one solid and well written post a week over three where I just throw up pictures and some cheeky text about winter jackets. I want to choose quality words in conversations. I no longer need to be the one that talks the most. Lately, I’ve been simplifying my wardrobe down to well-crafted and staple pieces over the disposable trendy options that require little appreciation. I only want to share quality pieces of information and images on social media. The excessiveness in which we just word vomit things for everyone to read is alarming. I want to be more intentional on where we purchase our food as to be more in-the-know on where it came from. The most convenient option isn’t always the best. I want to deepen and enrich the friendships I already have instead of just being an acquaintance to a larger circle of people. In the online world terms, this means I want to foster the community I already have instead of focusing so much on numbers. I want to stop and ask myself.... does this add value to my life/blog/marriage/friendships. My hope is that this will challenge me to be creative and disciplined with my decisions, actions and time. In sum, I want better instead of more. 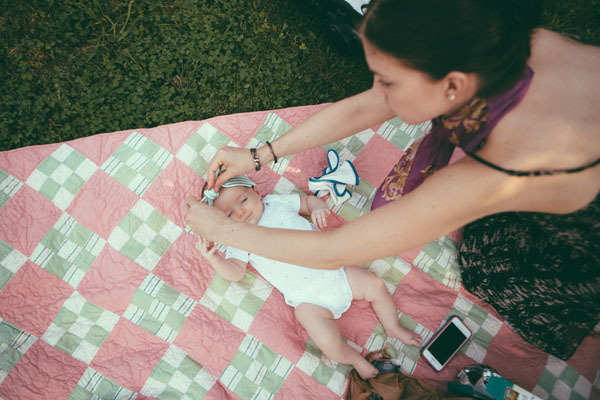 Your beauty routine as a mom is more like a Formula 1 pit stop. Its got to be fast, efficient and leaves me looking in the best condition possible without expensing serious time in front of the mirror. In the first few weeks of Parker’s life, my primping was pretty minimal. As long as I could get under eye concealer, a few swipes of mascara and some powder on my face, I was feeling pretty good. And shower? That was considered a luxury I was only able to partake in after she went to bed and, only then, if I pep talked myself into staying awake long enough to actually use shampoo. Ah, those were the days. Now that P and I have more of a schedule down (and I use the word ‘schedule’ so very loosely! ), it’s easier for me to predict how much time I have to get ready based on her attention span. I usually place her in front of the floor length mirror, as babies sure do love to shamelessly stare and laugh at their own reflection. I have learned to achieve maximum productivity in a very small amount of time. Mainly, I have whittled down the products I use to the bare minimum. I’ve cleaned out the useless stuff, and now, stick to just what I know will get the job done. I decided to share a few of my top picks. I do have a few other go-to’s in each category, like lipsticks, but these are my tried and true. 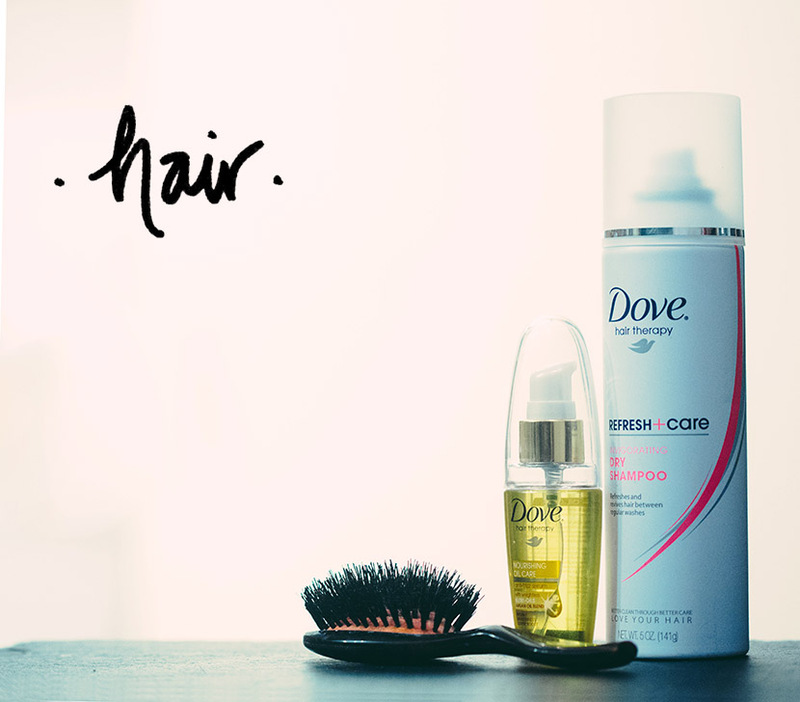 Dove Dry Shampoo - Washing my hair was never a top priority pre-baby, so we all know it wasn’t make its way up the list once she was here either. I’ve always been a dry shampoo or baby powder or even just plain flour user to help make my hair appear as if I had the time or energy to wash my hair. Dove Nourishing Oil - Here’s the truth, I once saw in a magazine interview with the Olsen twins hairstylist that he uses this on their tresses. So I obviously bought it….. and it’s a bargain at $4.00 a pop. Four months later, it has helped tame my hair in the summer and especially between cuts when the ends start to look a tad damaged. Frederic Fekkai Brush - I truly felt like an adult when I invested in a good brush. It really makes a huge difference when you’re blow drying your hair with a quality brush versus the ones I used to pick up on the clearance shelf at Target in my college years. Estee Lauder - Here’s the deal. This stuff is legit. 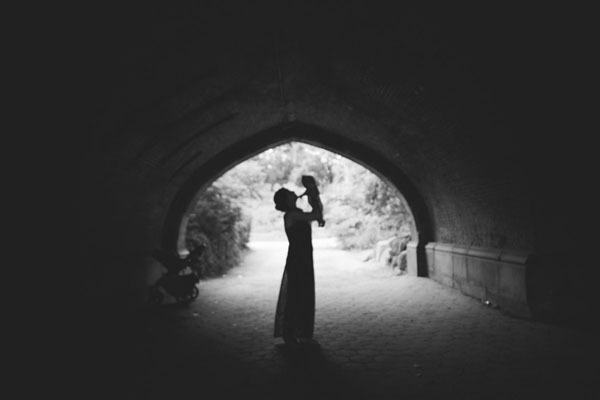 On the day I had Parker, I wasn’t planning on going into labor, so I had gone through my morning routine to run errands around Brooklyn. But, then I ended up with a baby. Anywho, I had this makeup on, as I do most days, and literally through all the chaos at the hospital, I didn’t have time to take it off. So, it wasn’t like I got dolled up to go have a baby. But here’s the thing….. it stayed on… and I mean, after all was said and done, it was almost 30 hours later and it looked nearly the same it did when I applied it…. pre-baby. Almay Undereye Concealer - If you want to buy your girlfriend who’s about to have a baby the best gift ever. Get homegirl some good under eye concealer. This stuff covers a multitude of sins and for that…. I am thankful. Stila One Step Prime - This sucker is basically an all-in-one for your makeup needs. If I was lost on a deserted island, I hope this would survive with me. It’s a primer, a lip color, perfect for a little blush, and great as eye shadow too. Really, what will they think of next! Bareminerals Mascara - Normally, I would use those mascaras with the primer on one side and the mascara on the other because it helped with clumps and evenly separated the lashes. Now, this is all I need because it does such a crazy job on its own. Beauty Blender - I could get on my soap box for days about the beauty blender. Seriously. I did a whole post about it. Go read that and then go buy yourself one. You’re welcome. Witch Hazel - After hearing the raves about the benefits of witch hazel, I was so intrigued and then finally won over. It’s eco-friendly, super gentle and reduces inflammation. I now apply it once in the morning prior to my lotion and makeup and then once in the evening after I wash my face. It’s the single best part of my routine. Clearasil Refreshing Face Scrub* - When I found out I was pregnant, I immediately stopped using any product that contained salicylic acid as it’s a big no-no while you’ve got a bun in the oven. Generally, in life, you should use it sparingly. But, I was recently gifted some Clearasil products to try out and have some surprisingly refreshed skin during these winter months. My dermatologist suggests only exfoliating once or twice a week, so I don’t use this all that often. The oils your skin produces are essential to keeping it healthy. Purpose Gentle Cleansing Wash - My skin can be pretty sensitive. I have rosy cheeks and if something is too harsh on my skin, I can see it immediately. This wash has been a staple in my routine for years. It cleans without destroying my skin in the process.